For a luxurious holiday in Croatia book this lovely 2014 Lagoon 450. 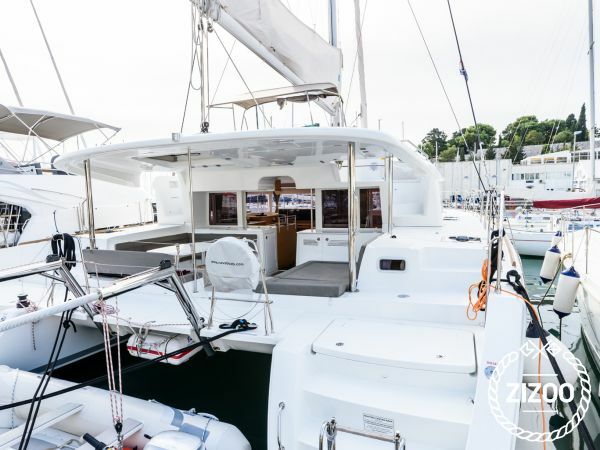 This spacious and elegantly designed catamaran features 4 double bed cabins, an additional 2 single berths in the salon and a fully functional kitchen. Gather your crew and conquer the gorgeous blue waters of the Adriatic Sea. Hoist your sails and let the wind propel you to hidden bays, secret coves, beautiful beaches and breathtaking natural wonders. Some of our favourite places to explore include the Blue Cave on Bisevo, the military base on Vis, the nightlife in Makarska and Vodice, and the centuries old history of the UNESCO World Heritage Site of Trogir. As you sail around and discover some pretty fantastic places along the Croatian coast, don't forget to try some of its delicious foods and take home some local wine and olive oil, instead of the usual postcard or magnet as souvenirs. Spend an incredible summer at one with nature and contact the charter crew to book this catamaran today.